AFC Rushden & Diamonds return to the scene of one of the more famous away days this weekend as they look to maintain their bid for a top-five finish in the Evo-Stik League South Premier Division Central. 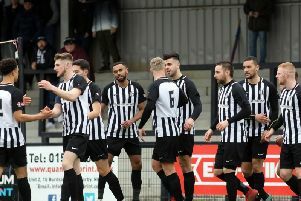 Diamonds returned to winning ways with a 2-1 success over Needham Market at a windswept Hayden Road last Saturday to move back into the play-off places as they hunt an extended season in their debut campaign at Step 3. With seven games to go, Andy Peaks knows his team must keep winning if they are to stay on course and their next assignment comes at Barwell tomorrow (Saturday). And the trip will bring back fond memories for the Diamonds boss and some of the members of his squad after a last-gasp Liam Dolman goal earned them a 2-2 draw at Barwell in the fourth qualifying round of the FA Cup back in 2015 after Diamonds had just been promoted to Step 4. “I think it’s just another reminder of how far we have come in a short space of time,” Peaks said. “That is a day people still talk about because we were the underdogs and the scenes when we scored that late goal were memorable. “It will be nice to go back there and, to be honest, we go there for a game that is probably just as important. “Last Saturday was a massive test for us on the back of a couple of defeats. If you lose three in a row at this stage then it is really going to hurt your chances. “The boys put a shift in and they did it in really tough conditions. “We just have to keep going. We know we will need to carry on winning games. 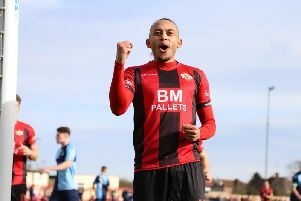 Peaks is hopeful top scorer Tom Lorraine will be fit for the clash after he was withdrawn with an ankle injury after coming on as a substitute against Needham Market. And full-back Zack Reynolds is also expected to be available after he missed last weekend’s game due to illness.